As the 45th RAGBRAI (Register’s Annual Great Bicycle Ride Across Iowa) fast approaches, Upper Iowa University’s Team Peacock is ramping up its annual fundraising campaign and is striving to raise over $30,000. As in past years, the 2017 team members have set individual goals in raising funds for a select UIU project or program that each individual has a passion for. The 2017 Team Peacock roster includes over 40 UIU faculty, staff, alumni, and other friends of the University who will officially ride with or support the team. Among the riders is six-year veteran and 2011 alumna Crystal (Czarnecki) Chapman of Ankeny, Iowa. 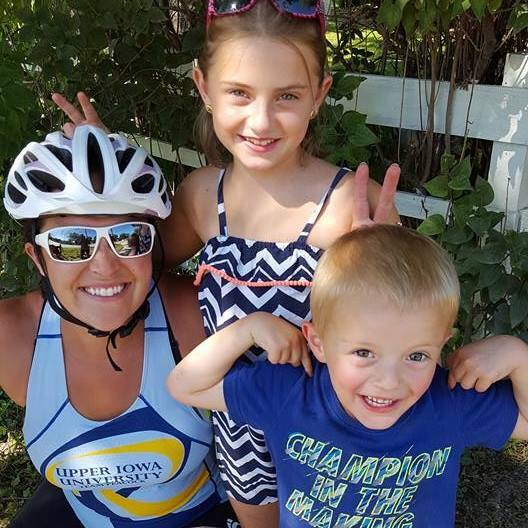 UIU alumna and Team Peacock member Crystal Chapman had some fun with a couple of her biggest fans, Khloe Keller and Colton Bohanan, while pedaling through Corning, Iowa, during RAGBRAI 2016. In addition to various scholarships, the beneficiaries from this year’s fundraising effort will include UIU in 3D – Sculpture and Ceramics Studio, UIU Annual Fund, Betty’s Team Fund (Andres School of Education), UIU Student Activities, Peacock Athletic Fund, UIU Wrestling, UIU President’s Home, UIU Men’s Basketball, Outdoor Pursuits, School of Science and Mathematics Churbuck Dean’s Fund, UIU Baseball, UIU Mock Trial Program, London and Paris Study Abroad, School of Business Dean’s Fund, Colorado Alumni Chapter Fund, Team Peacock Marketing Expansion, UIU Alternative Spring Break, UIU Women’s Tennis, Greenhouse/Botanical Research, and Military and Veterans Service Center. RAGBRAI is also utilized as part of the University’s marketing strategy to increase awareness and outreach across the state. Serving as UIU ambassadors, this year’s Team Peacock riders will sport newly designed cycling gear featuring the new University and Peacock logos. Team Peacock will join 10,000-plus other riders in making the 411-mile trek across Iowa in 2017. Team Peacock is scheduled to depart in support vehicles from Victory Gate at Fayette Campus on Saturday, July 22. The RAGBRAI journey begins in Orange City on Sunday, July 23. Overnight stops will take place in Spencer, Algona, Clear Lake, Charles City, Cresco and Waukon. As is tradition, the bicycle tires will be dipped in the Mississippi River this year in Harpers Ferry before the ride ends in Lansing on Saturday, July 29. For additional information on the Team Peacock participants, their respective causes, and how you can provide your support, go to uiu.edu/alumni/teampeacock-give.html. Follow Team Peacock throughout RAGBRAI on its Facebook page at www.facebook.com/teampeacock.